Kansas Gov. Jeff Colyer says he will wait until the results of the GOP primary race for governor are final before he begins a campaign for the general election. 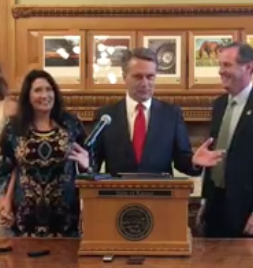 Colyer responded after Secretary of State Kris Kobach said earlier Wednesday that he would immediately begin campaigning against his Democratic opponent, Laura Kelly. 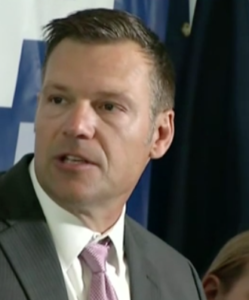 Kobach said it’s imperative that the party not wait to start the general election campaign, because the Democrats won’t wait. Kobach led Colyer by fewer than 200 votes after Tuesday’s election. The outcome will be determined by thousands of provisional and mail-in ballots that have yet to be counted. Colyer says he is hopeful and “very confident” the final vote will give him the GOP nomination. But he said he would be happy to work with Kobach should he win. State elections director Bryan Caskey said the secretary of state’s office is estimating that between 8,000 and 10,000 provisional ballots were cast. And mail-in ballots postmarked Tuesday have until Friday to arrive in local election officials’ offices.